We have been catching glimpses of upcoming Motorola Moto M here ant there over the past few months. Seeing how the suggested November 8 release date is mere hours away at this point, it is understandable that more information has started to slip through the cracks. 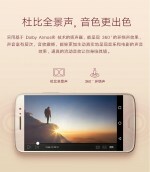 The latest such leak consists of a rich collection of official-looking banners for the handset. They are all in Chinese and bear a great design and stylistic resemblance to other press materials spotted in the wild. Besides offering the opportunity for a good close-up look of the new Moto M and its metal unibody design, these also reaffirm previously suggested specs. The Moto M is going to sport a 5.5-inch 1080p touchscreen, a 16 MP main camera with PDAF, an 8 MP selfie cam, dual-SIM support and LTE. Powering it will be the MediaTek Helio P10 chipset, along with 4GB of RAM and 32GB of storage. The handset will boot Android 6.0 Marshmallow out of the box and a 3,050 mAh battery will keep the light on. The Moto M will have a fingerprint reader on the back, also Dolby Atmos audio support from what we can only infer is a stereo speaker setup and also a water repellent nano coating, like many other Moto phones. As already mentioned, the Moto M is expected to debut alongside the Lenovo P2 on November 8 in Gold and Silver. Pricing is said to be in the CNY 1999 ball park on its home Chinese market, which roughly translates to $300. is Motorola owned by Lenovo?, never heard about it before.